Courtesy of Betina Lorscheitter, Copacabana Beach, Rio de Janeiro, Brazil. There is no open water race in the world where the start and finish are as competitive or as important as the relay race at the Rei e Rainha do Mar (King and Queen of the Sea) in Copacabana Beach. The annual made-for-television invitational race is broadcast to a live nationwide television audience by TV Globo in Brazil. TV Globo brings in drones, helicopters, underwater cameramen, FINA race officials, and several cameras to capture the mano-a-mano action from every angle. 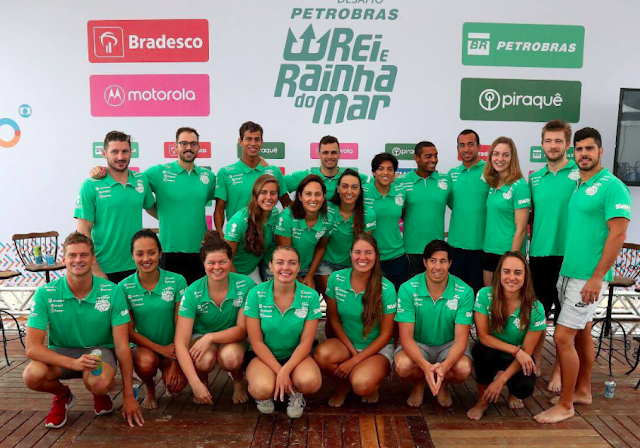 With dramatic announcing of the event and music blaring from speakers on the beach, the Rei e Rainha do Mar is always a spectacular race to witness. Today, it was especially dramatic as this event was the final race by soon-to-be-retired Poliana Okimoto. The Olympic bronze medalist teamed up with Fernando Ponte, Allan do Carmo and Ana Marcela Cunha with great weather shining down on Rio de Janeiro. While the Team Brazil (yellow) was stacked with Olympic studs, they had to fight it down on every single leg to win. The five teams - racing for prize money - consisted of four elite swimmers who raced two legs each of a tight 400m loop course, running in and out of the surf. The swimmers were partnered by country or continent with Brazil represented by two teams in addition to a team from Africa, the Americas and Europe. All of the swimmers had competed at the Olympics, FINA World Championships or international events like the FINA 10K Marathon Swimming World Cup or FINA Open Water Swimming Grand Prix. The athletes - two men and two women - took turns running down the white sand beach into the Atlantic Ocean, followed by a series of fast dolphins under the crashing 2-foot surf and an all-out 400m sprint around giant 3-meter buoys in water. On the second-to-final leg, Olympian Allan do Carmo pulled his team near the lead, but it was anyone's race to win on the final lap that boiled down to a showdown between Ana Marcela Cunha and Betina Lorscheitter. Both women have raced each other for years in Brazil and international races. Both athletes know each other's strengths and it was literally a matter of who would get that little edge in the run up the beach. 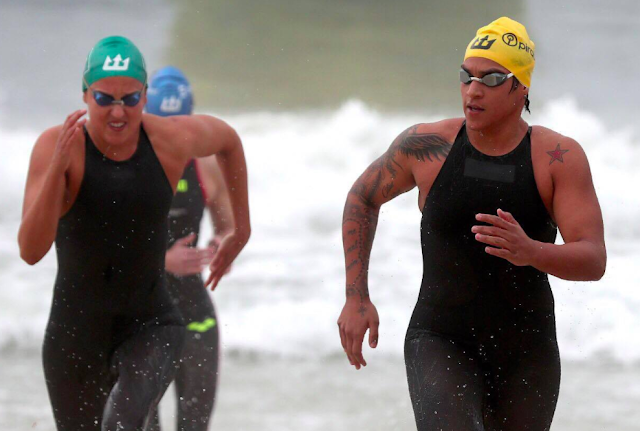 In a fitting end to a marvelously lengthy open water career that started on Copacabana Beach in 2006 at the Travessia dos Fortes, Poliana Okimoto was able to stand on top of the podium on her final race. For that, she needed her teammate Cunha to edge out Lorscheitter on the final steps of the race. "The intensity of the athletes is always so beautiful to watch. Their passion for the sport is obvious," observed Steven Munatones. "The swimmers brought their finest talents to today's event. Whether first, second or last, they showed competitiveness in the water and sportsmanship after the race. Their mutually felt camaraderie is so genuine and pure."